As we rethink our resolutions, we might recall that it was on this date in 1908, at one second after midnight, that the Times Square Ball first descended. In 1903, The New York Times newspaper was about to open their new headquarters, the city’s second tallest building, in what was then known as Longacre Square. The paper’s owner, Adolph Ochs, decided to commemorate their opening with a midnight fireworks show on the roof of the building on December 31, 1903. After four years of New Year’s Eve fireworks celebrations, Ochs wanted a bigger spectacle at the building to draw more attention to the newly-renamed Times Square. 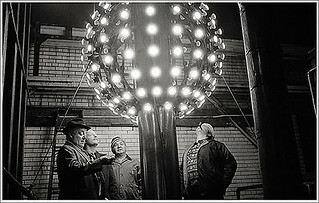 An electrician was hired to construct a lighted Ball to be lowered from the flagpole on the roof of One Times Square. The iron Ball was only 5 feet in diameter! The very first drop [celebrated] New Year’s Eve 1907, one second after midnight [so, on this date]. Though the Times would later move its headquarters, the New Year’s Eve celebration at One Times Square remains a focal celebration for the world. For the evolution of the ball-drop over the years, see here.